It's close to sunset, as we drive towards suburban Mumbai. We get down and walk towards a small studio, where the main area is bustling with a flurry of activities. PRs and managers working on schedules, journalists from various media outlets discussing the fate of recent films, and spot dadas distributing tea, all outside a swanky vanity van parked adjacent to the studio. While we patiently wait for our much awaited interaction, the man of the moment - Shahid Kapoor, walks out of his van, looking sharp in a Gaurav Khanijo shirt and a pair of relaxed chinos, with his favourite coffee tumbler in hand. "Hello everybody," he called out with an infectious smile, while greeting all the digital editors, journalists, and photographers, waiting outside the studio. He takes a sip of the piping hot coffee and joins a conversation on the film - The Ghazi Attack. Like a curious film aficionado, Shahid asked the journos about their opinion, and was eager to understand what the film was all about. Well, although I am not really a veteran, I can vouch for the fact that we have rarely come across artists who take time out to discuss films and cinema in general (outside their own films, of course) with journos waiting for their interview slot. But, that's Shahid Kapoor for you - simple, honest, earnest and very focused. Oh, and a complete cinephile! Right from a phenomenal performance in Udta Punjab to working on Rangoon, launching his signature athleisure clothing - Skult and the biggest highlight of all, the birth of his 'angel' - Baby Misha. Clearly, 2016 was all about the Kapoor boy. Somewhere, the heart tells me (or rather, predicts) that the actor is all set to shine bright this year again (and ultimately, get a clear sweep at the awards too). And deservingly so. After all, he has got two power packed performances coming up, with characters that are distinct and quite unique. While one has him playing a soldier, the other has him portraying a Rajput King. 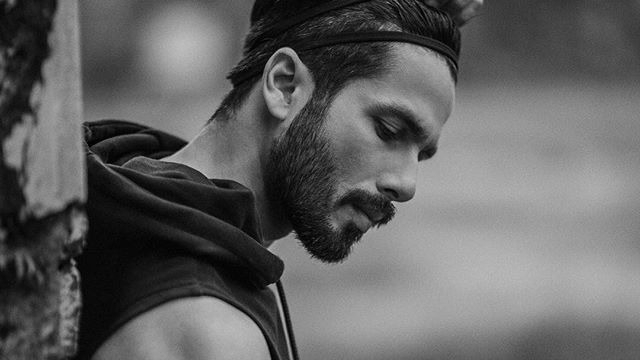 As an actor, Shahid has constantly evolved himself and doesn't shy away from roles that demand time and physical transformations, a commitment that is rare at a time when it's all about the BO number game. But over time, the actor has successfully carved a niche for himself by collaborating with fine directors, creating memorable performances, and working in films, that earn both appreciation and profits. All hail Sasha! 4-5 rounds of interviews and a few hours later, we are informed about our slot. As we walk into the room, filled with standees and posters, it's hard to miss the excitement for Rangoon in the air. 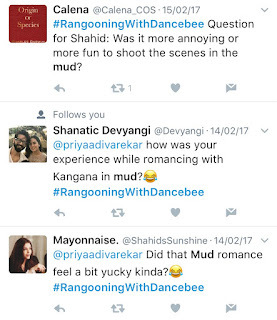 As Shahid walked towards the interview area, we realised that the actor had a bout of viral flu while promoting the film a few days back and we asked him about his health. "Oh! I am much better now. But, the cold is still there, I guess, it's just the weather," he said, while welcoming us with a warm and happy smile. The supremely suave actor settled down for a long, in-depth chat. I say long, because he asked his team to avoid disrupting the conversation. Now, guess whose turn was it to flaunt a big, bright smile? Ha! You have always taken up challenging characters, that have different shades to their personality. Like, Udta Punjab's Tommy Singh had those rockstar vibes, but deep down, he was vulnerable and child like. What was essaying Nawab Malik like and what were the challenges that the character brought for you? My last two characters had shades of grey and were not very likeable kind of guys. They didn't have that "Wah! Yeh toh hero hai" kind of a quality to them. And the next two that I am essaying, be it Nawab Malik in Rangoon or Rawal Ratan Singh in Padmavati, are both heroic. They are people who one would look up to and say, "Wow. Humein bhi aisa hona chahiye." Whether it is from a man or woman's point of view, I think Nawab Malik is an extremely powerful and heroic character. His need to attend to his country and sense of patriotism moved me. When I read the script, I knew I wanted to play this guy. I wanted to understand how somebody can be so bound by duty and passionate enough to put the nation ahead of everything else in their life. For me, Nawab Malik is more of a soldier than a lover in this film. He stumbles upon love and is actually very bad at it. He is really good at being a soldier and attending his duties. Although he is an officer in the British Indian Army, so that's where the dichotomy comes in. He is a patriot, who loves his country, but is serving for the British Indian Army. So, he is essentially working against the country. This is your third collaboration with Vishal Bhardwaj. How has your equation with the film maker changed over time? I have always said, there are certain film makers who should lead from the front. The films that they make are true representations of them. I think they are the right people to make and be the face of such films. Vishal is one such film maker. Another one is Sanjay Leela Bhansali. Unfortunately, they are so much into their work, that they don't get enough time to engage with the media more often. Maybe, you should arrive at his house some day (smiles). No, seriously! When he talks about the film, he is able to express it in so many ways, which is a lot more superior to what any of us can do. So, working with him is an extremely enriching experience. Overtime, I do think we have understood a lot about each other. Vishal was giving an interview just sometime back, where he was asked about his experience of working with me, Kangana and how was it different. He said, "With Kangana, it was our first time and quite different as she comes prepared. But with Shahid, we just look at each other from faraway and know what to do." I just felt really nice about it. I would always think it's just me who understands this, but never knew that he too would feel the same way. Vishal and I are a great fit, and that has only improved with the way we have worked. Sometimes, it's difficult to explain in words (smiles). But, you know, sometimes you try a shoe and it fits wonderfully? Maybe, that's just how it is. As an actor, what was that one moment on the sets of Rangoon, that left you in complete awe? A lot of times, people feel there is a major scene and as an actor, you must have felt great about it. But sometimes, you feel good even in the smallest of moments. There is an opening sequence in the film, where Nawab is in the middle of a war. It has heavy shelling, firing going on and we have tried to shoot all of this largely as a single shot. I have a very strong memory of this in my mind, because I was really overwhelmed when the shot got cut. I actually felt like I was in the middle of a war zone. What was your biggest takeaway from Rangoon? I have developed huge respect for our armed forces, especially after doing some of those sequences. That really is my biggest takeaway. The kind of circumstances that they have to deal with, and the absolute chaos that war is, especially that time, really got me inspired. I really felt how minuscule I am and the kind of cry babies most of us can be. Even the most simple things look so difficult to us. Nawab is a soldier who does so much for our country. These are the people who are our real heroes. So, we should feel very fortunate to have this country to ourselves and must do everything we can to do a good job with it. During an earlier conversation, I remember you said that while prepping for a character, you prefer staying away from references or modelling a character around something that has been done before. I have always liked the idea of creating a character, which is new, original and different. It shouldn't remind the audience of something that you have seen before. My idea of preparing for a role usually involves research, conversations, imagining how the character will eventually shape up. So, thinking about that era, how people around would behave or talk, why does Nawab Malik react or think the way he does - those are the thoughts I like focusing on. A large part of our fraternity depends on references. It's like - "Woh film thi na. waisa kuch banate hain." Arey par, woh toh ban gayi na. So, let's do something that hasn't been done before. I am much more in that direction as a person. I just feel originality comes from places that haven't been explored or experienced before. So, you have to feel unsure, scared and vulnerable. We were shooting in January, and it was extremely cold. There was more than 20 - 30 kilos of mud on and all around us. We had to be wetted down before every shot. So, it was not an enjoyable experience at all (smiles). In fact, I fell ill right after that and was very unwell for quite sometime. But, when you watch the film, you will realise that it is one of the nicest scenes and looks beautiful. But yes, it was an absolute pain shooting for that particular scene. One of my worst memories of shooting for this film (laughs). Wearing that uniform and becoming a soldier is a great feeling, Utkarsha. Like I said, Soldiers have a sense of righteousness and passion for duty that is unmatched. It is absolutely amazing. You do feel quite moved and extremely proud.